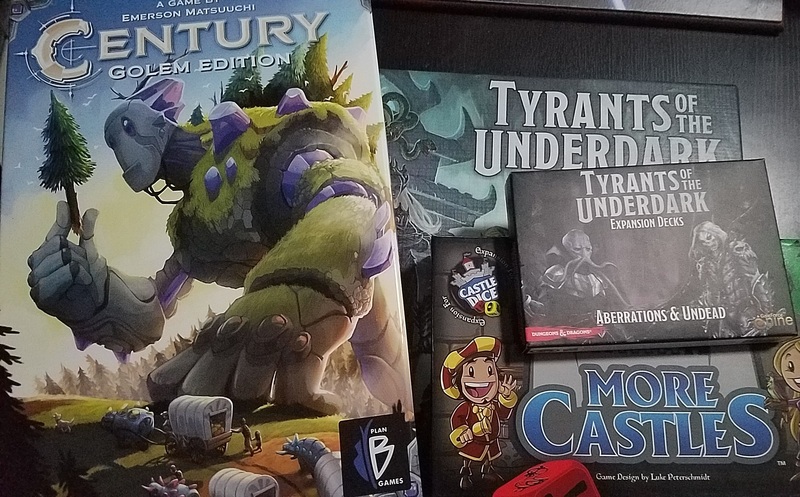 For new games, I got Century Spice Road: Golem Edition and D&D Tyrants of the Underdark. In addition to that, I also ordered the Tyrants of the Underdark Expansion and an the Expansion to Castle Dice: More Castles. I have played Century Spice Road: Golem Edition before and I loved it. It is a Splendor-esque game that is very well done. I enjoy this game more than Splendor. I got the Golem Edition because the quality of the pieces are noticeably better such as the plastic gems instead of the wooden cubes. D&D: Tyrants of the Underdark is a game I've wanted since the GenCon I was at when it came out a couple of years ago. It is a deck builder where the deck moves around your house's drow to control the various Underdark cities. A drow based game wouldn't be completed without spies and assassins to infiltrate your opponent's forces to get the upper hand. The Expansion to Tyrants of the Underdark has different card stock which is noticibly different in thickness, feel, and the ink color on the back of the cards. I was going to get clear sleeves to sleeve them in, however due to the discoloration, they need opaque sleeves. The Expansion card stock is nicer, so they didn't downgrade the expansion cards to save money, they upgraded it make it better. Castle Dice: More Castles fixes quite a few of the issues with the original game, though from the reviews I've seen, it doesn't look like it fixes everything to where it would be the game that I wanted it to be when purchasing it. Without the expansion you don't have much control as far as where your strategy goes or what cards you get as everyone draws from the same decks. In the Expansion, players draw from their own asymmetrical decks, which can solve some of those issues of not getting the right cards or getting cards that pull you in different directions. I'm going to play it as is with the expansion, but I'm thinking that I'll actually modify the rules over time and tinker with them. I'm not a guy who messes with designer's rules, but this game had a lot of potential in my mind for a fun strategy and luck based game, where right now there seems to be very little strategy involved. I'm excited to get these to the table soon and see how they are. I'll have review articles down the line with links to other reviews of the games and my own thoughts so you can make educated game purchase decisions.